On Ethics: Do Ethics Matter Anymore? I have discussed ethics on An American Editor in a number of essays (see, e.g., “On Ethics: To Out or Not to Out Clients” [Part I and Part II]; “A Question of Ethics: The Delayed Project Further Delayed”; “A Question of Ethics: If the Editing Is Running Behind Schedule…”; “The Ethics of Distaste”; “The Ethics of Editing: Padding the Bill”; “The Ethics of Editing: The Sour Job”; “Trolleyology and the Ethics of Editing”; and “Ethics in a World of Cheap”), but I am now wondering whether ethics matter. Editors do not live in isolation, cut off from the world around us — or we shouldn’t. We need to be engaged with our surrounding world because it is our worldly experiences, along with our education and interests, that shape our editing. It would be difficult to provide a quality edit for a book on genocide if we did not know what genocide was and how it has appeared in history. We do not need to be experts in the subject matter, but we need to have some, at least rudimentary, knowledge about the subject matter. Thus we are engaged with our world. In addition, we are engaged because we are citizens of our world and country. We cannot shut our eyes and pretend that what is happening next door, across the street, around the corner doesn’t have an impact on our own lives. And that is what makes me wonder if I have been wrong all along when I thought that ethics matter, that following an ethical path is important, that ethics is part and parcel of being a professional editor. What I see around me is a vast change. A pebble was dropped in the ocean and the ripples it created are becoming a tsunami as the wave approaches the other side of the ocean. We have always had unethical members of the editing profession; every profession, every trade, every job type has workers who are ethical and workers who are unethical — except, we hope, for one very specific exception: president of the United States. It is not that our presidents haven’t been ethically challenged on occasion; they are human and have human failings. It is the striving to be ethical that matters most and I cannot recall or think of a president who I would declare as wholly unethical — until now. Which is why I am concerned. My reward for being an ethical business person, an ethical editor, is that I have work, I earn a decent wage, I have a place among my colleagues (i.e., they do not shun me for being unethical). And just as I sought to be ethical in my business, I expected others to be ethical in theirs. If they were not ethical, I expected them to not be rewarded for being unethical. Consequently, when we discuss questions of ethics, we discuss them in terms of balancing the scales of right and wrong and how, when we strike that balance, the answer affects not only ourselves but others. That is and has always been the foundation of ethics. Until the Donald Trump run for and election to the presidency. Now my world of ethics is being turned upside down. I get work and earn a decent living, but I am not a millionaire, let alone a billionaire, and I have not been rewarded with the power to set editing’s future direction. I am just an everyday schmoe of little influence and relevance. In contrast, a man who appears to have no ethical boundaries, who doesn’t separate fact from fantasy, who is divisive, who steals from others and calls it business, is rewarded with election to the presidency of the United States and monetary wealth. Sure I go to sleep at night with a clear conscience, but, I am willing to bet, so does Donald Trump. So I ask the question: Based on the example of Donald Trump, do ethics matter? Would editors be better served to ignore questions of ethics and do whatever it takes or they can get away with? For example, instead of checking references, should the editor just style them and not care whether the cite information is correct, even though the agreement with the client is for the editor to check references for accuracy? Think of how much time and effort could be saved — time that could be spent on other, perhaps more profitable, pursuits. When we discuss our fee and what it includes with an author, should we justify our fee by mentioning services that we will not really perform? Had you asked me on November 1, I would have said doing so was highly unethical and no, we should not only not do so but we shouldn’t even think about doing so. But today I waver. I do not waver for myself; I know what path I will follow — the same path I always have. I waver on the question of whether or not ethics matter today. Does anyone expect ethicality? If we are willing to elect someone who wholly lacks an ethical and moral compass to lead us, why should we expect more of those who work beside us or for us? We are entering what is being called the “posttruth age,” a time when truth is whatever someone declares it to be. I think it might be better labeled the Trumpian Fantasy Age. It is an age when ethics are mutable, when ethics flow in all directions simultaneously, when ethics and honesty take a back seat to enrichment and fantasy. While the effect may be minimal on the current generation of editors, what will the effect be on future generations? Will anyone ask, will anyone care, whether a particular action is ethical? Does the future of editing lie in an ungoverned, undisciplined editing profession? Has the political world of 2016 so upended the community’s moral compass that anarchy looks as if it is disciplined? Do ethics matter anymore? In my previous two essays, “The Business of Editing: Wildcarding for Dollars” and “The Business of Editing: Journals, References, & Dollars“, I discussed two ways to improve efficiency and increase profitability by using macros. Today’s essay digresses and discusses correcting earlier-made errors. I need to put errors between quote marks — “errors” — because I am using the term to encompass not only true errors but changes in editorial decisions, decisions that are not necessarily erroneous but that after reflection may not have been the best decision. Today’s discussion is focused on the Multifile Find macro, but the Sequential is worth a few words. The Sequential F&R works on the active document. It is intended for those times when you know that you want to run a series of finds and replaces. If you are working on a book and it is evident that the author does certain things consistently that need changing, you can use this macro to put together several items that are to be changed sequentially and you can save the criteria so that you can reuse them again in the next document. I often find that, for example, authors use an underlined angle bracket rather than the symbol ≤ or ≥. I created a F&R for these items that I can run before editing a document to replace the underlined versions with the correct symbols. For editorial “errors” I have made, however, it is the Multifile Find macro that is important. As I have said many times, I tend to work on large documents. The documents tend to be multiauthored and each chapter is its own file. Sometimes I am able to work on chapters sequentially, but more often they come to me in haphazard order. Consequently, I have to make editorial decisions as I edit a chapter that may well affect earlier chapters that have yet to arrive. And it may be that if I had had the ability to edit the earlier-in-sequence chapter first, I would have made a different editorial decision. For a recent example, consider “mixed lineage kinase.” My original decision was to leave it unhyphenated, but as I edited additional chapters my thoughts changed and I decided it really should be “mixed-lineage kinase.” But as is usual with these kinds of things, I had already edited another half dozen chapters when I changed my decision. In addition, by that time, I also had edited close to 40 chapters and I couldn’t remember in which chapters “mixed lineage” appeared. The first questions to be dealt with are the ethical questions: First, is “mixed lineage kinase” so wrong that it can’t simply be left and future instances of “mixed-lineage” changed to the unhyphenated form? Second, if it needs to be changed to the hyphenated form, do I need to go back and change the incorrect versions or can I just notify the client and hope the proofreader will fix the problem? Third, if the future versions are to be hyphenated, can I just leave the unhyphenated versions and hope no one notices? We each run our business differently, but number one on my list of good business practices is good ethics. In this case, the third option, to me, is wholly unacceptable. It is not even something I would contemplate except for purposes of this essay. A professional, ethical editor does not fail to accept responsibility for decisions she makes; he does not attempt to hide them. The decisions are faced squarely and honestly and dealt with, even if it means a future loss of business from the client. The crux of the ethical question is really the second option. This depends on circumstances. If, for example, I know that the earlier edited material has already been set in pages, it makes no sense to resend corrected files. A note to the client is needed. If they have yet to be set, then new files are the order of business plus advising the client. The key is the advising of the client and identifying where the errors occur. I think that is the ethical obligation: for the editor to identify to the client exactly where the errors are to be found so that they can easily be corrected and to provide new files at the client’s request. The report tells you name of the document in which the phrase is found, the page it is found on, and how many times it occurs on that page. With this report, you can manually open the named files, go to the appropriate page, and decide whether a particular occurrence needs to be corrected. If I am not sure whether the client can use corrected files, I send the client a copy of this report along with my mea culpa. If I think the client might be able to use corrected files, I correct them and send the files, the report, and my mea culpa. The update option requires a few different steps than the generate report option. The biggest difference is that you need to save the find criteria for the update option; you do not need to do so for the generate report option. I enter the find term in the first field (#1 in image above). I also need to check the Inc? (for Include?) box (#2). Only those terms listed that also are checked will be searched for. If I do not want the current active file also searched (assuming it is in the selected search directory), I check the box at #3, which is also where I select the search directory. 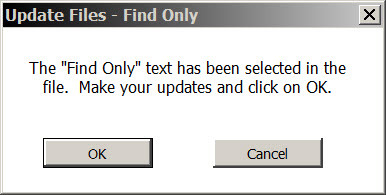 Because I want to update the files, not generate a report, I check Update files (#4). I then Save my find criteria (#5). The way the macro works, is that it will first search the files for the first listed find term. When that is done, it will proceed to the next listed term. As you can see, you can list up to 10 terms to sequentially find. The macro then proceeds to the next file in which it finds the term and the process continues until the term is no longer found or you cancel the process. Again, I think it is clear how the right macro can save an editor time and make editing more profitable. In my experience, it is the rare editor who doesn’t have a change of mind the further along she is in editing a project. I think it is a sign of a professional editor. But editing is a business and as a business it needs to make a profit. One way to do so is to minimize the time and effort needed to correct “errors” and to do so in a professional and ethical manner. Over the years, I have found that using Multifile Find has not only enhanced my profitability, but it has enhanced my reputation as professional editor because my clients know that I am not only willing to recognize that I have made a mistake, but I am willing to correct it. One reason I am willing to correct a mistake is that it doesn’t take me hours to do so; I can do it efficiently with EditTools’ Multifile Find. Recent discussions about ethics made me realize that I have failed as an editor and writer. I meant one thing, Erin Brenner and the American Medical Writer’s Association meant something else. This became obvious in private correspondence with Erin wherein we used the same term, ethics, but meant different things. As Erin noted in our correspondence, there are two definitions of ethics: “the rules or standards governing the conduct of a person or the members of a profession” and “the study of the general nature of morals and of the specific moral choices to be made by a person; moral philosophy” (see The American Heritage Dictionary); I meant the first and she meant the second. Why is this important? Because of the reference to the American Medical Writer’s Association’s Code of Ethics. What I see as necessary is less an abstract code of ethics than a concrete code of professional responsibility. The difference can be like that between night and day. AMWA’s is a code of ethics because it states unenforceable and undefinable ideals. To say, for example, as AMWA Principle 3 says, “Medical communicators should write, edit, or participate in the development of information that meets the highest professional standards…,” is a wonderful aspiration, but it is only an aspiration because “highest professional standards” is undefinable. Ask 25 people to spell out exactly what is meant by that aspiration and you will get many different “definitions.” In this regard, the Society for Editors and Proofreaders’ Code of Practice, is much closer to what I think is needed, although it is only closer, not quite there. A major failing of the AMWA code, and perhaps even of the SfEP code, is the lack of interpretive, published decisions and public enforcement. In contrast to aspirational ideals, a code of professional responsibility lays out definable, graspable, and, most importantly, enforceable rules of conduct; it also usually has a body of interpretive opinions so that adherents know what is expected in defined circumstances. Enforcement means that there is a public penalty for ignoring the guidance. Think of it like a judicial opinion. A court opinion has no value if no one knows what the facts are that led to the opinion and what the parameters of the opinion are. The idea is for those bound by the code to understand their obligations and modify their behavior accordingly. It is the seeking of a behavioral consensus. Codes of professional responsibility usually have mechanisms by which a person bound by the code can submit a scenario and receive guidance on how to behave. For example, an editor could ask: “I was told the client had a budget of $1500 and I agreed to work for $50 an hour. But the work is not complete after 30 hours. Can I just keep working and bill the client until the work is done?” and receive a guiding opinion that lays out what the correct action is under the group’s code of professional responsibility. The question and response would be published so all editors would receive the same guidance. Assume that the response is “No, you cannot continue to bill. You knew what the budget was and by agreeing to undertake the job implied to the client that it would not take more than 30 hours to complete. It is your obligation to complete the work at your expense.” (I know there are lots of missing facts and lots of other appropriate answers. This is just for illustrative purposes) When published, other editors would see what is expected under similar circumstances and would be expected to conform their behavior in the described situation to the guidance. More importantly, the answer would act as guidance for the client–editor interaction. If the editor ignored the decision and continued working and billed for the additional time, the client would be able to point to this decision as justification for not paying above the budget. Whether that would stand in a dispute resolution action is a different matter, but at least for widely accepted codes, such as in medicine and law, such a decision would have significant weight in the dispute resolution proceedings. The fact that there is a decision that is attuned to specific facts gives guidance to both editors and to clients. Both know what to expect and what needs to be done. And, importantly, if properly constructed, there would be interim guidances and final guidances, with the final version not being settled until community comments were considered. Ultimately, the question comes down to what is the advantage to having a code of professional responsibility and published guidance interpreting the code’s canons in various circumstances? The answer is that it raises the status of the profession in the minds and eyes of all interested parties. And for those who voluntarily agree to adhere to such a code and to the interpretive decisions, it gives them increased standing within the editorial and client communities. Perhaps, most importantly, it instills in clients a sense of confidence in the professionalism of the editor. Is it difficult to create such a code? Not really. This is the type of endeavor that needs to be done by consensus. A small group of editors could easily begin by reviewing codes from various disciplines, including law and medicine. Once a basic code was created, it could be published for feedback from the editorial community. Ultimately, once adopted editors will agree to be governed by it when they see it is in their best interests. To bring such a code about is just a matter of will and interest within the editorial community. Additionally, once such a code and body of interpretations were created, it would be easy to create standardized certification courses that demonstrate ethical competency. What do you think? Are you interested? Would you agree to be bound by such a code? (Are you ready to volunteer to start the process?) Or do you think that a code of professional responsibility is not needed for the editorial profession? In a recent essay, “The Practical Editor: What Does Professional Certification Look Like?,” Erin Brenner discussed certification of American editors. The essay also provoked a number of comments. Yet, I found the essay lacking in one respect: There was no mention of requiring taking a course in ethics and passing an ethics exam as part of the certification process. To my way of thinking, certification implies that the person certified is not only skill competent but also not ethically challenged. Yet the certification programs pay little to no attention to ethics issues. Many certificated professions require the taking and passing of ethics courses and exams. I remember having to take such a course in law school and then having to pass a special ethics exam administered by the State of California in the early 1970s. If I failed the ethics exam, I could not be admitted to the practice of law even if I earned a perfect score on the bar exam itself. Over the years and on many different editor forums there have been discussions about ethics. Colleagues would ask a question, seeking advice from others about how to handle a particular situation. We’ve asked and discussed questions of ethics many times on An American Editor in essays like “Trolleyology and the Ethics of Editing”, “The Ethics of Editing“, “The Business of Editing: The Ethics of Billing“, “Ethics in a World of Cheap“, “The Business of Editing: Expectations“, and “The Business of Editing: Walking the Line”, to cite a few examples. Ethics are always on an editor’s mind, as ethics should be. But we lack a uniform standard of ethics that can act as a guide to our decision making and against which we can be judged. Even though we constantly ask questions about ethics (“What would you do in these circumstances?”), there seems to be a dearth of focus on ethics in conferences or in certification courses. Conferences and courses all focus on the mechanics of editing — the things that we can do to improve our earnings or to improve our editing skills and make us more desirable to clients and prospective clients. Consider, for example, the certification program offered by the University of Chicago Graham School. Not one of the required classes focuses on ethics. The same is true at the University of Washington, the MediaBistro Online Editing Course, and the University of California at San Diego Copyediting Program, to name a few of the available certification programs. Even the Editor’s Association of Canada offers tests of your editing skills, but not of your editorial and business ethics. From this (admittedly) incomplete survey of certification courses, one could surmise that editorial and business ethics are not particularly important in the editing profession. I have always thought that ethics was important in all business dealings. The purpose of certification is to broadcast to clients and prospective clients that we are qualified to perform the services we offer. It is a way to distinguish professional from nonprofessional editors. Similarly, meeting ethical standards is a way to separate professional from nonprofessional editors. Of course, simply passing an ethics exam is insufficient. The certifying agencies need to also be enforcers of the ethics standards. Thus our problem. First, we have no single agency that sets standards that editors must meet to gain certification. The agency that sets the standards does not need to provide the courses to educate editors to those standards; other institutions can do that, just as is done with lawyers, doctors, and accountants — the key is to have a standards-creating organization whose standards form the educational core around which other organizations form their programs. Second, we have no standard set of ethics. Each editor establishes and interprets his or her own ethical standards. As a profession we need an ethics-setting agency that also has the authority to resolve ethical questions and disputes, especially disputes between clients and editors. Third, and perhaps in today’s environment most important, those programs that offer certificates should create an ethics course and require that students take the course and pass an ethics exam as a condition of certification. This would (a) make the courses more valuable, (b) would put ethics on par with editing skills, and (c) would help reassure clients and prospective clients. Fourth, I would like to see conferences include seminars on editorial business ethics. We need to begin exposing editors to the types of situations that can hurt an editor–client relationship because of misunderstanding and teach editors how to avoid those situations and how to resolve ethical conflicts that might arise. Regardless of what path, in terms of nationwide standards setting, is taken, I believe that certification programs need to take the lead and incorporate an ethics component into the requirements. This would be good for the editor, for the certification program, and for clients. It is not enough that an editor be master of editing skills; an editor who is ethically challenged and who angers a client as a result threatens the livelihood of all editors. We need to remember all those author comments on forums like LinkedIn expressing the author’s unsatisfactory experiences with editors and who tell everyone who will listen that it is better to self-edit or have trustworthy friends do the editing. If you look at their complaints carefully, many of them are ethical complaints. We also need to remember that ethics is part and parcel of doing business, especially a service business such as editing. The more we discuss and educate ourselves about ethics issues, the better our business will be. The trolley is coming down the track and you are standing by a switch. If the trolley remains on the current track, it will kill five people who are tied to the track and cannot escape. If you throw the switch, the trolley will veer onto a spur on which one person is tied and will kill that one person, but the five people will be saved. Do you/should you throw the switch? This is the conundrum of right and wrong, which underlies most religious and moral beliefs. Reading this book made me think of editing ethics. I grant that the decisions we have to make are not of life and death, but still, they can be weighty and certainly raise the specter of morally and ethically right and wrong behavior. Is the absence of the conundrum equivalent to saying that there is no ethical or unethical behavior, there is just behavior? Is this a conundrum for philosophers to quarrel over but that has no particular value outside the philosophical debates? As with most philosophical questions, there are only philosophical answers, any of which can be correct at a given moment in time. I think few of us would say that editing (of all stripes, including proofreading) raises such philosophical conundrums that we grind to a halt as we consider them and discuss them with colleagues. Over the past 30 years, I have had editing-related “philosophical” discussions with colleagues only on a handful of occasions, and those discussions were rarely earth moving. I suppose our initial foray into the conundrum is whether we are competent to handle the project being offered. This is not about our competency in general as an editor, but our competency specifically for the project in question. For example, we work alone, there are 3,000 manuscript pages to be edited; they require a “heavy” edit; the subject matter is a sub-sub-subspecialty area of nuclear physics, an area with which we have no familiarity; the manuscript is heavy in math, which we know is a weakness; the schedule is six weeks and cannot be extended, which means we would have to edit 500 manuscript pages a week, yet the best we have ever done is 300. The project is for a long-time client who pays very well (more than any other client we have) and will pay double our usual rate. Finally, if we do not accept this project, we currently have nothing else to fill the time, although it is always possible for something to come along. Also, the project still will have to be done by someone — and that someone might be even less qualified. What do we do? Some of us will immediately decline, outlining our reasons for the client. Some of us will accept and hope that we can convince the client to extend the deadline. Some of us will simply accept and hope that we do a satisfactory job. Some of us will accept and try to find colleagues to work on the manuscript with us. Regardless of which path we take, I suspect that most of us would think more about the practical problems than the philosophical problems associated with the project offer. But should we be so focused on the practical problems, or should we have already had a philosophical discussion about such a situation and have our moral and ethical compass already set to give an answer to the offer? My thinking tends toward the latter. Should our decision be based on schedule and our past history with regard to schedule? That is, if the schedule requires 500 edited pages per week but the most we have ever done is 300, are we morally obligated to turn down the project because we have never accomplished that speed before? Or is this one of those ethical considerations that need to be given some weight, but not much weight because we can find techniques that will speed up our editing? Which raises the question of whether we would be substituting technique for skill. Let us not forget the money part. The offer comes with more money than usual — a doubling of our normal fee. Why? Is it not the client’s recognition of the difficulty of the project and the client’s method of incentivizing us to undertake what appears to be a difficult project? How much should the fee offered govern our decision-making process? If we were to prioritize elements of the offer, where would we place fee? I know that some of us would say that before approaching these or any other question about the offer, they would insist on seeing a few chapters to make their own decision about the project’s difficulty. Even if chapters are chosen at random, how much can we learn from them? The two or three chapters randomly chosen could be the most difficult to edit, the longest, the shortest, the easiest to edit, or something else that would unduly influence a positive or negative reaction. Such a review could (and likely would) divert us from addressing the more important underlying ethical and moral questions. In a sense, that is exactly the problem: We editors do not have a universal code of morality or ethics that serves as a guide to any of the editorial decisions we make, which range from whether to accept an offer to whether to bill the client for hours we didn’t actually spend on the project because we were more efficient than the client calculated we would be (in other words, the project took us 50 hours but the client expected it to take and budgeted for 75 hours. Do we bill for 50 hours or 75 hours?). In the absence of such ethical codes, editors tend to approach the job-offer problem from the practical side rather than the philosophical side. Granted, in our instance, unlike in the trolley problem, there is no balancing of life versus death(s). And I also grant that in the trolley problem the dilemma has a cultural/religious element (substitute for the trolley problem the abortion problem and its variations) that editing will rarely face (an exception being, perhaps, the offer to edit a virulently anti-Semitic book that calls for a new genocide). Yet I think we — and our clients and profession — would gain greatly were we to have this discussion and come to a consensus on what constitutes ethical and moral behavior for an editor and what doesn’t.